ASOTRACAMPO, a collective of 62 families, mostly subsistence farmers and victims of several displacements due to the armed conflict, were completely evicted in December 2015 in midst of the ongoing peace process. They had formed the community of El Tamarindo on untitled wasteland in the outskirts of Barranquilla on the Atlantic Coast, land that had been declared part of the free trade zone, and thus generated interest of powerful regional families. El Tamarindo was cited by Amnesty International as an emblematic case of the problematic implementation of policies in Colombia meant to restitute land to conflict victims, competing with economic investment. 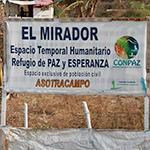 After several evictions, in March 2014 ASOTRACAMPO had created the temporal humanitarian space of El Mirador on the last plot of land not evicted, trying to resist eviction and neoparamilitary threats. The final evictions of El Tamarindo left ASOTRACAMPO members dispersed and in a very vulnerable situation. FORPP has accompanied ASOTRACAMPO in El Mirador, documenting the pressures the community faced to displace again without secure and adequate alternatives for their families. Currently FORPP is supporting ASOTRACAMPO by political accompaniment in their advocacy for dignified collective relocation as subsistence farmers.